Following is the complete list of fourteen letter (14 letters) words starting with C and ending in C for domain names and scrabble with meaning. 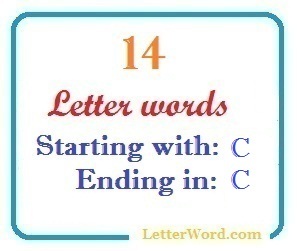 This list of 14 letter words beginning from c and ending with c alphabet is valid for both American English and British English with meaning. You can use these fourteen letter words for finding good domain names while playing scrabble or in research.